Long-term impacts of acidic deposition on the Great Smoky Mountains National Park (GRSM) include elevated inputs of sulfate, nitrate, and ammonium; the depletion of available nutrient cations from soil; and acidification of high-elevation streams. Critical loads and target loads (CLs/TLs) are useful tools to help guide future air quality management. We evaluated past and potential future effects of nitrate and sulfate deposition for 12 watersheds in the GRSM, USA, using the hydrochemical model, photosynthesis evapotranspiration biogeochemical (PnET-BGC). Two of the streams studied were listed by the state of Tennessee as impaired due to low stream pH. We reconstructed historical meteorological, atmospheric deposition, and land disturbance data for study watersheds for the period 1850 to present for model hindcasts. As future emissions are expected to decline, the model was run under a range of future scenarios from 2008 to 2200 of decreases in sulfate, nitrate, and ammonium and combinations of sulfate and nitrate deposition to estimate CLs and TLs of how watersheds might respond to emission control strategies. Model simulations of stream chemistry generally agreed with long-term (>10 years) observations. Model hindcasts indicate that watersheds in the GRSM are inherently sensitive to acidic deposition. Simulated mean projected stream ANC of 71 μeq/L (range 32 to 107 μeq/L) prior to industrial development (~1850) decreases in response to historical acidic deposition to 33 μeq/L (−13 to 88 μeq/L) in 2007. Future model projections show that decreases in sulfate deposition result in smaller increases in stream ANC compared with equivalent decreases in nitrate deposition; simultaneous controls on nitrate and sulfate deposition are more effective in ANC increases than individual control of nitrate or sulfate. 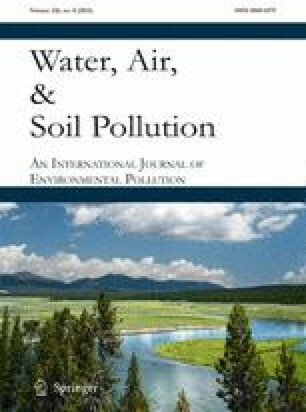 Although there are no current programs in the USA to control ammonia emissions, model simulations suggest that decreases in ammonium deposition could also help mitigate acidification to a greater extent than equivalent controls on nitrate deposition. The online version of this article (doi: 10.1007/s11270-015-2502-7) contains supplementary material, which is available to authorized users. This work was supported by the National Park Service under Agreement H54710090015 signed September 25, 2009. Zhai, J., Driscoll, C. T., Sullivan, T. J., and Cosby, B. J. (2008). Regional application of the PnET-BGC model to assess historical acidification of Adirondack lakes. Water Resour. Res, 44, W01421. doi: 10.1029/2006WR005532.